How is it possible to discuss the 'complete resolution of genetic architecture' while completely ignoring gene-gene and gene-environment interaction? I am not at all convinced, as these authors are, that a majority of the missing heritability can be explained by rare variants. I also completely disagree with the last sentence of their abstract: "Whereas major challenges undoubtedly remain, particularly regarding data handling and the functional classification of variants, we suggest that these will be largely practical and not conceptual". How is it possible that the major challenges are practical rather that conceptual when we do not yet fully understand the complexity of the human genome? After years of linear gains in the genetic dissection of human disease we are now in a period of exponential discovery. This is particularly apparent for complex disease. Genome-wide association studies (GWAS) have provided myriad associations between common variability and disease, and have shown that common genetic variability is unlikely to explain the entire genetic predisposition to disease. Here we detail how one can expand on this success and systematically identify genetic risks that lead or predispose to disease using next-generation sequencing. Geneticists have had for many years a protocol to identify Mendelian disease. A similar set of tools is now available for the identification of rare moderate-risk loci and common low-risk variants. Whereas major challenges undoubtedly remain, particularly regarding data handling and the functional classification of variants, we suggest that these will be largely practical and not conceptual. Our paper on visualization of human microbiome data has been accepted for publication as part of the 2011 Pacific Symposium on Biocomputing (PSB). This paper describes our 3D Heatmap application that harnesses the power of 3D video game engines. The 3dheatmap software is freely available from Sourceforge.net. Be sure and buy a 3D mouse! Moore JH, Cowper Sal.Lari R, Hibberd P, Hill D, Madan JC. Human microbiome visualization using 3D technology. Pacific Symposium on Biocomputing, in press (2011). High-throughput sequencing technology has opened the door to the study of the human microbiome and its relationship with health and disease. This is both an opportunity and a significant biocomputing challenge. We present here a 3D visualization methodology and freely-available software package for facilitating the exploration and analysis of high-dimensional human microbiome data. 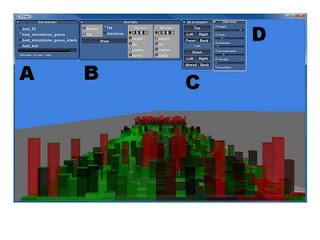 Our visualization approach harnesses the power of commercial video game development engines to provide an interactive medium in the form of a 3D heat map for exploration of microbial species and their relative abundance in different patients. The advantage of this approach is that the third dimension provides additional layers of information that cannot be visualized using a traditional 2D heat map. We demonstrate the usefulness of this visualization approach using microbiome data collected from a sample of premature babies with and without sepsis.